A few weeks ago, I went to a Korean restaurant with Max. We typically plan on where we are going before we go to ensure we are eating at a high-quality restaurant with paleo options, but this was a spontaneous last minute decision late on a Friday evening and it was a good one! 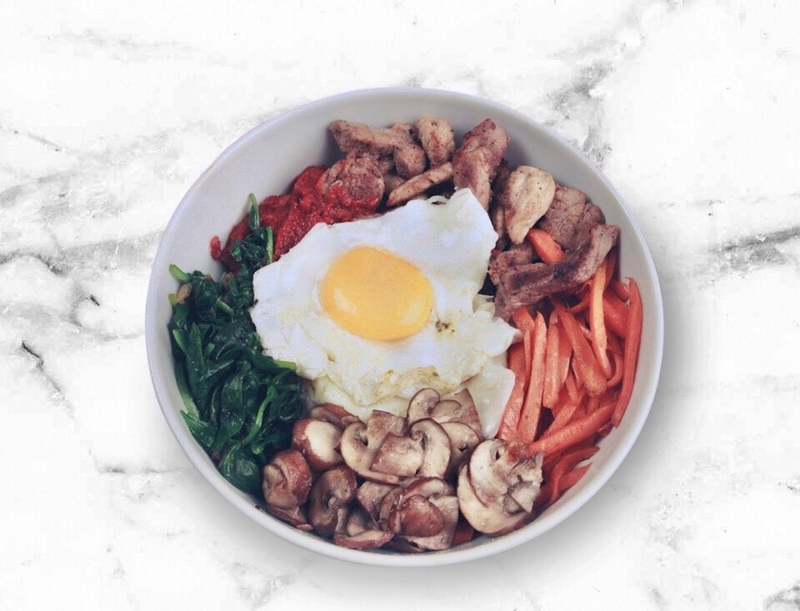 I had my first experience with Bibimbap, a traditional Korean dish made with rice, meat, vegetables, and a fried egg. It's typically served in a hot bowl to keep the food warm and crispy. It was delicious. In fact, I was so pleased with my Bibimbap experience that I decided to create a grain-free version that you can make at home. I switched out the regular rice for cauliflower rice, added all kinds of fun vegetables, and chopped chicken as my meat. Feel free to get creative with this recipe and opt for ground pork, turkey, beef, sausage, whatever you fancy. Same goes with the vegetables, choose an array of colors and flavors to make this bowl extra nutritious. 1) In a small bowl combine garlic, ginger, coconut aminos, sesame oil, raw honey, and sesame seeds. 2) Heat a cast iron skillet over medium-high heat. Add grass-fed butter or cooking oil of choice. Slice chicken into small nuggets and throw into the skillet. Cook thoroughly (approx. 8-10 minutes), until no pink is present. Add sauce to the skillet 5 minutes in. 3) Add 1 tablespoon of cooking oil, sesame seeds, and spinach to the skillet. Saute until spinach has wilted. Transfer to a bowl and set aside. Repeat with red bell pepper, squash, and shitake mushrooms. 4) Prepare the cauliflower rice by adding sesame seed oil and cauliflower rice to the skillet. Add seasonings and saute cauliflower until cooked through. 5) Divide cauliflower equally between four bowls. Top with chopped chicken, spinach, squash, mushrooms, red peppers, and shredded carrot. 6) Add grass-fed butter and eggs into the skillet. Cook eggs to your fancy and top bowls with fried eggs. Garnish with sesame seeds and serve!